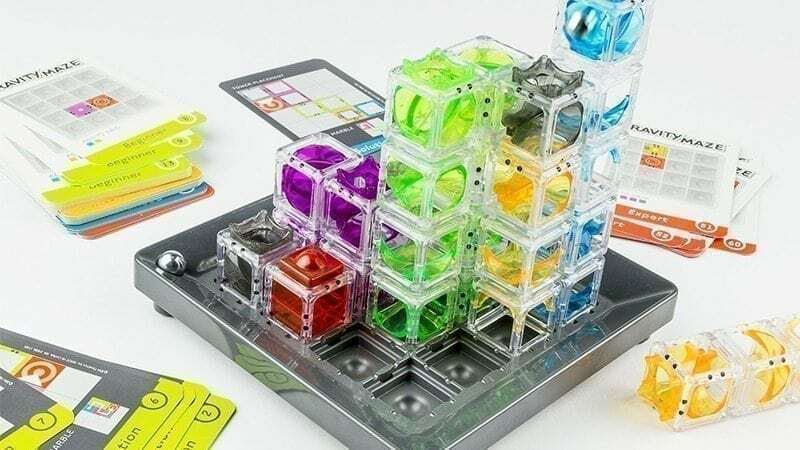 The ThinkFun Gravity Maze is an engaging game that will provide hours of fun for your child while giving the added benefit of teaching them reasoning and visual perception skills. The game combines the traditional marble drop maze with a goal of getting the marble to fall into into a specific target after manipulating the placement of towers on the game board. Game cards are given to show the starting point and end target locations. Once the starting tower and target are placed it is up to the player to figure out how to get the marble to the end target using a combination of the provided towers. Game cards range in difficulty from beginner to advanced. The game requires innovative strategies to reach completion but more than one correct solution exists. Inquisitive kids will be enthralled for hours and will delve ever deeper as they tackle increasingly difficult board placements. The game combines a unique combination of fun tactile learning with trial and error that results in a gratifying sense of accomplishment once a solution is found.